Over the winter of 2014/15 the team manager and I were having a discussion about how to gain more experience and therefore improve our race results. Part of that conversation came the discussion about going to more tracks and getting a wider range of track experience to help shake off bad habits formed earlier in my career and to open my horizons to other possibilities. From that discussion we decided to go down to Chuckwalla Valley Raceway in January of 2015 and run the track on my 2011 MartianCraft ZX–10R. Being on a track in January in sub–60F (15C) temperatures was an absolute eye opener for me. Tire warmers are effectively useless at these temps. First lap will be hot, sure. But after that, if you aren’t keeping the heat in the tires they are going to cool down on their own. Needless to say I learned a lot about heating up tires and maintaining heat that weekend! After sampling Chuckwalla in January the team manager approved us attending two races this year at Chuckwalla. One in the 2014/15 season and one in the 2015/16 season. A few months ago I wrote a negative review on my favorite gloves. After that review I went on the hunt for a new set of gloves to wear. I tried a large number of gloves in various stores as I was traveling for work and hunted for the perfect set. I discarded a lot of gloves purely from fit. While I don’t have “weird” hands, my size is a bit off. My palms are a little on the narrow side for the length of my fingers. I basically fit a large in the palm and x-large in the fingers. So I tend to use x-large gloves and then deal with blisters across the palms. 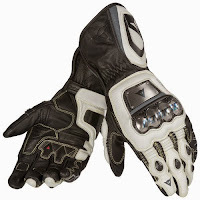 After not finding any gloves I liked, I “settled” on a set of Dainese Full Metal gloves. They were the 2014 model and were being discontinued and therefore came at a good price. I have had a few sets of Dainese over the years and while not amazing, they were pretty good. Fast forward to 2015 AFM Round 1 at Buttonwillow. Gloves had already been broken in on the street and track prior to the round. However by Saturday afternoon I had developed wear spots on both of my pinkies just below the knuckle in the middle of the finger. Both pinkies were red and tender. By Saturday night those spots were bleeding. By Sunday night it was very painful to put the gloves on or remove them. What started as a conversation on BayAreaRidersForum turned into an actual review of this unit. I had previously seen this unit being discussed in other contexts and reviewed their website in consideration of purchasing one for myself. The idea of tracking my lean angle is very interesting to me. Given the price of the unit though and that it was a “complete package”, my interest waned fairly quickly. Fortunately, rosemont83 from BayAreaRidersForum happened to own one of the units and offered to let me play with it for a weekend. That weekend also happened to be a race weekend with the AFM.